Special or “Chevron” type bits are forged from high quality steel and use heavy tungsten carbide inserts that are brazed in place with a superior silver alloy. 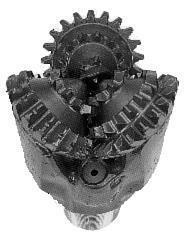 The Special or “Chevron” blade bits are available in 3 way design, and are more suitable for drilling in hard formations. Regular blade bits are available in 3-way step designs. 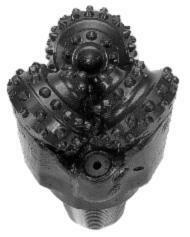 They are made to deliver maximum drilling penetration in soft to medium formations. The blades are forged from high quality steel and use heavy tungsten carbide inserts that are brazed in place with a superior silver alloy. This heavy-duty one-piece design consists of three drop forged segments. Carbide inserts are induction brazed for maximum retention. These bits are designed to drill in the softest formations such as soft shales, clays, and red beds, with high durability and maximum penetration rate. These bits are designed to drill formations such as shales, medium soft limestones, medium sandstones and other formations with intermittent hard streaks. These bits are designed to drill formations such as hard sandstones, dolomite, and broken formations with hard cherty streaks. These bits are designed to drill in formations such as shales, clays, limestones, and sand. These bits feature large chisel-shaped inserts to provide high durability and maximum penetration rate. These bits are designed to drill formations such as hard limestones, dolomite, hard sands, and other formations with hard cherty streaks. These bits are designed to drill extremely hard formations such as chert, granite, flint and taconite. These bits feature short, closely, spaced inserts to ensure maximum penetration rate and wear resistance. * BITS AVAILABLE IN ALL SIZES AND IADC CODES, NEW, NEW SURPLUS, REBUILT AND USED.